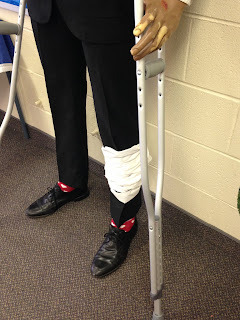 How to use a mannequin in your classroom #16: Break-out lesson! Bonjour fellow teachers! I'm excited to share a new idea with you that I tried for the first time last month. 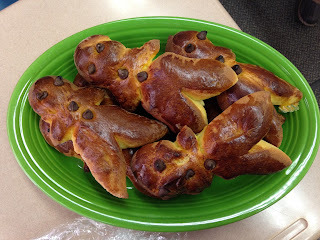 I was inspired by a presentation I attended at a world language conference on creating a "break-out" lesson. Have you heard of these? I decided to try one as part of my semester exam review in my French III class. It was a lot of work to create this lesson, and at one point I did wonder if it was going to be worth it. My students adored it though, and I thought it was fun, creative and a great way to review major concepts from the semester. If you aren't familiar with the concept of a break-out lesson, the basic idea is that groups of students are racing each other to unlock boxes containing clues which lead them to unlock the next box. Each group is racing to be the first to make it to the final box. So, one needs to create some sort of story which gives the students a reason for wanting to race to that final box. That was the fun part for me! 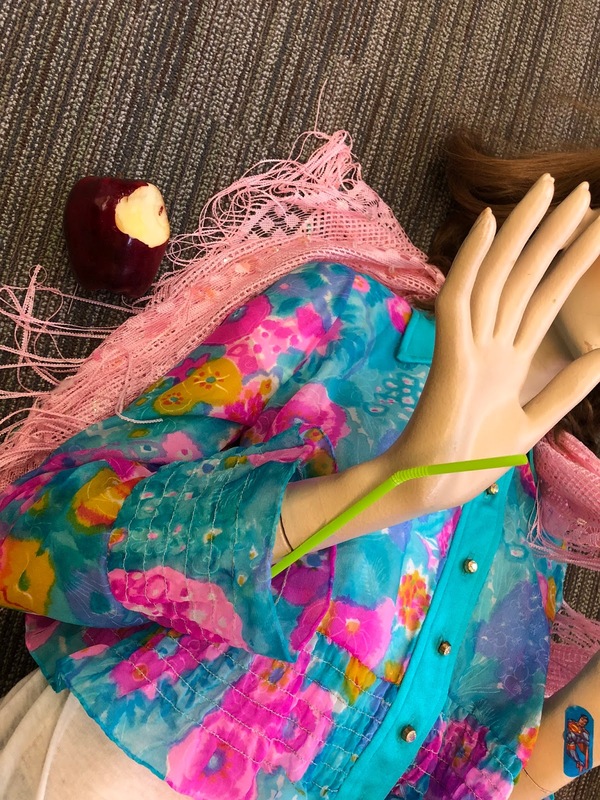 I created a story about one of my classroom mannequins, Suzette. My students are used to hearing stories about the adventures of my mannequins who go by the names of Jacques and Suzette, and they love any lesson that includes stories about their lives. I told students that Suzette was actually a secret agent working undercover for the Police Nationale, and that she had been poisoned. Their mission: find the antidote before it was too late! 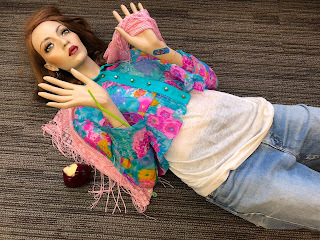 Notice the apple on the floor next to her...students were supposed to figure out that she had taken a bite and fallen to the ground because she had been poisoned. Suzette was visible from the door of my classroom, and other teachers and students stopped in to ask what was going on! I projected an image on the screen in my classroom that looked like a memo from the French police showing Suzette's photo, and her real name (Angèle LaFleur) and identity as a secret agent. I dressed up as a representative from the French police (trench coat, badge, etc.) and explained the mission to the class. Students were divided into teams (groups of 3) and given their first task. When they completed it and everything was correct, I gave them directions in French to the location of the next box and the combination to unlock it. Boxes were color-coded for each team, as well as numbered. 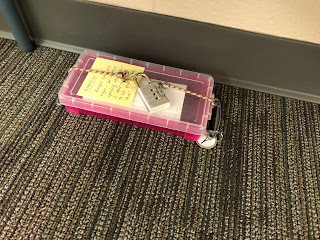 Each box is locked with a padlock, and contains another task inside for the group to complete. 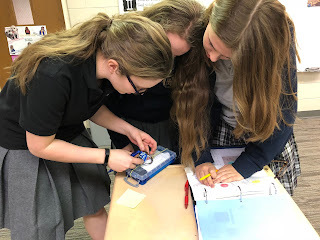 This team is working hard to unlock their box! Each team had 3 boxes to unlock before making it to the final box. The final box contained a syringe which I filled with talcum powder...this was supposed to be the antidote. The team that made it to the syringe first was able to inject it into Suzette's IV tube! Suzette's IV tube..it was actually a plastic straw. The winning team saves Suzette...umm, I mean, Angèle! They were rewarded with some French treats! The 3 tasks that each team completed were just review questions for 3 different topics that would appear on the semester exam. You could use any review questions or worksheets that you would normally use and make them the tasks for each group. Students were so engaged in this lesson that they were getting angry at each other for not hurrying fast enough and I had to intervene to calm them down. It was definitely exciting, and not your usual exam review lesson. I think it was a success! And now that I've tried it once, I think it will take much less time to create the next one. Please feel free to leave a comment if you'd like more details or if you have any questions. Happy teaching! Special thanks to my husband for coming up with the idea of the syringe and the IV tube :). And a shout-out to the Target Pharmacy for giving me the syringe for free! 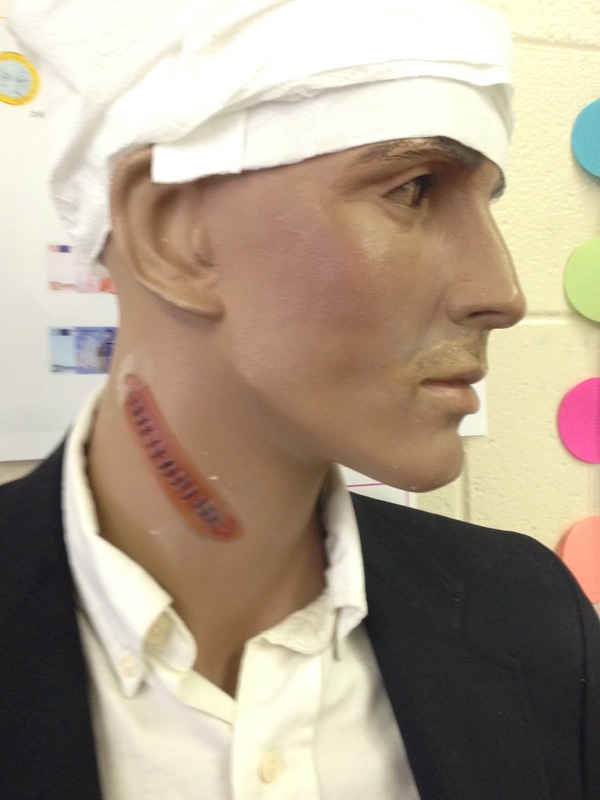 How to use a mannequin in your classroom #15: L'accident de Jacques! Instead of having the students describe what happened in random pictures of people who had suffered various accidents (found in their textbook), I asked them to describe what happened to Jacques. This was instantly more interesting to them. And they were interested in the lesson as soon as they entered the classroom...they wanted to know what had happened to Jacques. Students were asked to take photos with their iPads of Jacques' head, neck, hand and leg. Jacques has a bandage on his head, and stitches on his neck!! Jacques has a scar on his hand from a burn!! Jacques has a cast on his leg, and he's using crutches to walk!! I asked students to tell what type of accident Jacques had, and then to describe each of his injuries and the treatment for each injury. They used the Adobe Spark Video app to record themselves describing what happened in each photo that they took. They were able to share their presentations with me, and we watched what each student had created. For any of you who are able to use apps in your classrooms, I've been using Adobe Spark Video frequently and find it to be reliable and easy to use. It allows students to import photos and make voice recordings over the photos. I hope you enjoyed this idea! Happy teaching...summer is just around the corner. P.S. I bought the fake scars & stitches at a Halloween store. How to use a mannequin in your classroom #14: Le pique-nique de Jacques & Suzette! I would say that after more than 20 years in the classroom that one of the most important lessons I've learned is this: If you can get your students interested in what you want to teach them, it will make you instantly more effective as a teacher! My mentor would agree. When I was a new teacher, he encouraged me to find out what students wanted, and then repackage my lessons accordingly. I have found this to be very wise advice. My students are immediately interested in anything that has to do with my classroom mannequins. And why wouldn't they be? Wouldn't it be SO MUCH more interesting to sit in a lesson where a teacher was telling & acting out a story about a life-size department store mannequin than to read a boring dialog in a textbook about Pierre & Anne who went to the grocery store? 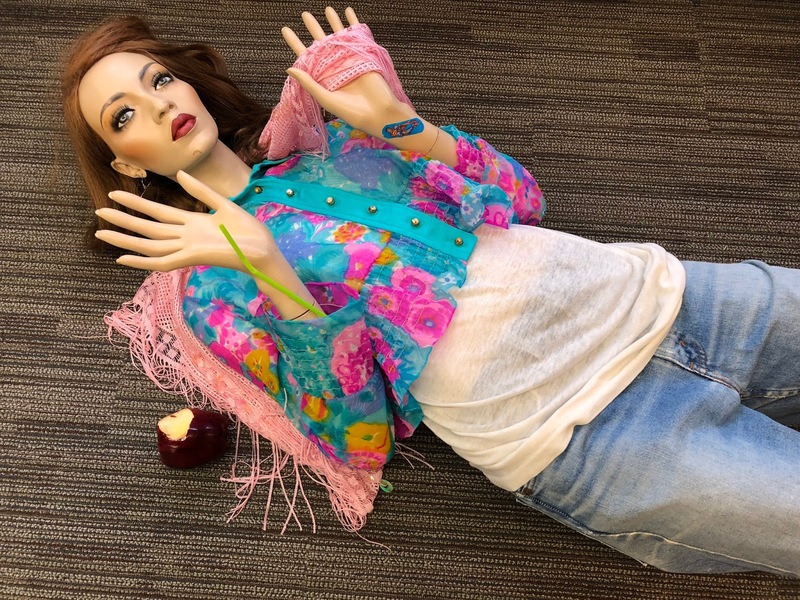 I took that textbook dialog meant to teach students how to use the passé composé and threw it out, replacing it with a story I wrote about Jacques & his girlfriend Suzette (my classroom mannequins, which you are aware of if you've been reading this blog) and their picnic date. Because we were learning vocabulary about how to describe the countryside, I chose to have the story take place in the countryside. I acted out the story for students with props. Here's a photo. I had already taught students how to form the passé composé (the past tense). In this lesson, I wanted students to practice using it in the context of a story. The story about the picnic date ended thusly: Jacques was waiting for Suzette to show up, having spread out the picnic (see above), and he was starting to get upset and wondering where she was. Students were instructed to write a few lines about what they thought happened next, using the passé composé. Then they acted out their lines for the class, and they always come up with some very creative endings, so this turns out to be quite enjoyable and engaging. I played the part of Jacques: Jacques got bored while waiting for Suzette, so he ate the whole picnic, and then he started shooting at squirrels with his bow & arrow...but he didn't know that Suzette had just arrived (she was behind the bushes), and he accidentally shot her with an arrow! She screamed, and he ran to her and told her he was so sorry. Then, he took off his shirt, tore it up and made a bandage for her leg. Above is Jacques' shirt, which I was wearing over my clothes. When I took the shirt off and acted out "ripping it", I didn't want to actually rip the shirt, so I improvised by ripping a sheet of paper for the sound effect. I thought my students would think this was dumb, but one of them stayed after class to tell me that was her favorite part of the story :). Then I picked Suzette up over my shoulder and RAN across the classroom with her to the doctor's office, where I also played the part of the doctor (see the props below). The doctor examined Suzette and told her she would be ok. Then Jacques hugged Suzette and told her he loved her. There was gasping, laughing and spontaneous applause at the end of this scene. Students were genuinely interested in what was happening. Afterwards, I gave them a typed copy of the scene, and asked them to change the verbs to the passé composé. As a result of these lessons, students heard, spoke, read and wrote the passé composé. They also enjoyed themselves, and so did I. Immensely. I love that teaching a language affords me the opportunity to be creative. Happy winter from the Mitten! This weekend I spent a lovely few hours in my kitchen trying a new recipe. Even though I've had the incredible good fortune to have lived in France, I had never heard of les petits bonhommes until I saw a French chef preparing them on a cooking show. They are absolutely adorable, and ever since I saw the show, I've wanted to find time to make them for my students. You can find the recipe here. Let me tell you, these things smelled heavenly! Not only are they cute, but to me they are so very, very French! I would describe the taste and texture as something close to a German soft pretzel, except that the dough is slightly sweet. They are made in Alsace (during the Christmas season), so I guess the pretzel-like dough must be a German influence. 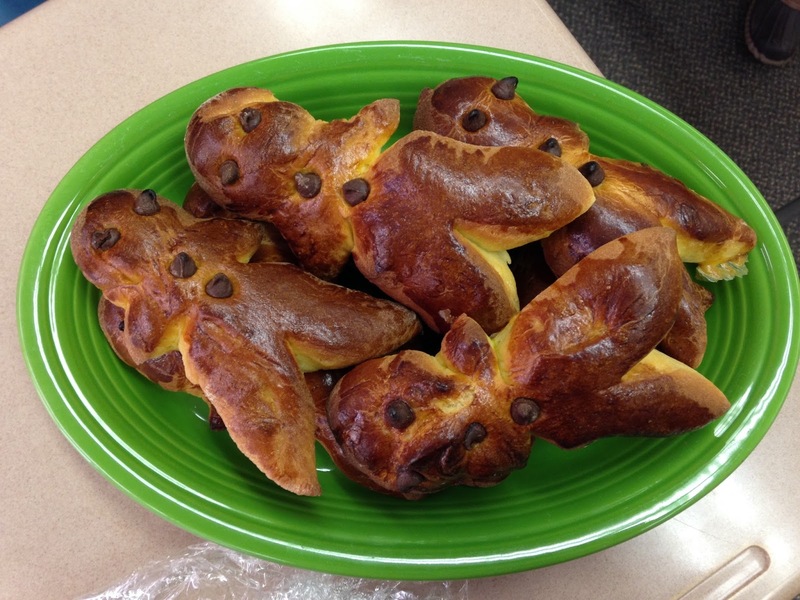 I only made a small amount since the recipe was so time-consuming, and I shared them with some of my upper level students since those are my smallest classes. What a fun way this was to celebrate French on a snowy day. They were delighted! And why wouldn't they be? France offers some of the most delicious foods in the world, and this is one of the things that makes the French culture so unique and special. I think offering my students new types of French food helps to rekindle their love of the culture, and therefore the language! If you like to bake, I highly recommend trying this out. Let me know how it goes if you do! 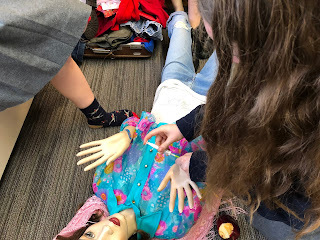 How to use a mannequin in your classroom #13: Crime Scene Investigation! As I write this post, I'm sitting by my swimming pool enjoying the month of July and reflecting on the past school year. This lesson was one of my favorite lessons, and it was something I'd never tried before. I think it's so important for teachers to continue to learn, grow, and adapt. This lesson was born out of a desire to find a more effective and interesting way to introduce the correct use of the passé composé (compound past tense) & the imparfait (imperfect tense) when describing past events. I used it in my French II class, which for me is the first time the concept is introduced. The idea I came up with is something that I discovered that many elementary school teachers already use...I first saw the idea on Pinterest. Here it is: use a crime scene investigation to get students to recreate a past event. Brilliant!!! I have to say that I've learned a lot from elementary school teachers over the years! 2. What time of day was it? 3. How many people were there? 4. What was Suzette (Jacques' girlfriend) doing? 5. What was the bandit wearing? 5. What did the bandit take? 6. What did Jacques hit with his hand? As a side note, if you're wondering about the shattered mannequin hand...you may have noticed in previous photos that Jacques is missing a hand :). The real reason for this is that I dropped it one day, and it shattered. I've always meant to repair it, but haven't. So it's been in my cupboard for years. 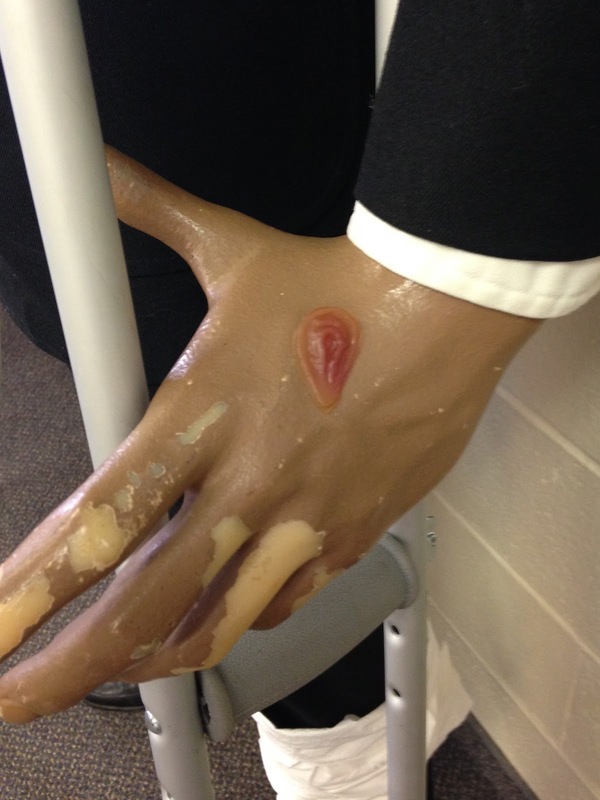 And students are always asking me what happened to his hand...so this was the perfect opportunity to make up a story about it! He smashed his hand saving his girlfriend from a bandit! This lesson was very successful. 100% of the class was interested and engaged. Students used critical thinking skills and were able to tell me what the rules were for choosing between the two tenses. And I think they actually enjoyed themselves in the process. I know I did. I'd like to thank author, teacher and presenter Dave Burgess for validating this approach to teaching. I read his amazing book on the first day of summer vacation this year. It's called Teach Like a Pirate, and if you haven't read it yet, I highly recommend it! He reminded me that engaging & exciting lessons like this are not less rigorous than those that include lengthy grammar exercises. In fact, he reminded me of the importance of getting students to want to learn what we're trying to teach them. It is essential to their success. I hope you'll consider trying a crime scene investigation lesson in your class next year! Please feel free to email me if you'd like to see any of the documents I used. I'd be more than happy to share them. P.S. I found the caution tape at a Halloween store, and I found the footprints, blood splatters and coffee stain via Google images. Also, I am not compensated to promote Dave Burgess' book :). Bonjour tout le monde! I hope you're all having a great school year! Today is the first day of my spring break, and I'm really looking forward to some rest and relaxation, and some time to catch up on my blogging :). And it looks like spring is finally arriving here in Michigan! I feel invigorated already! 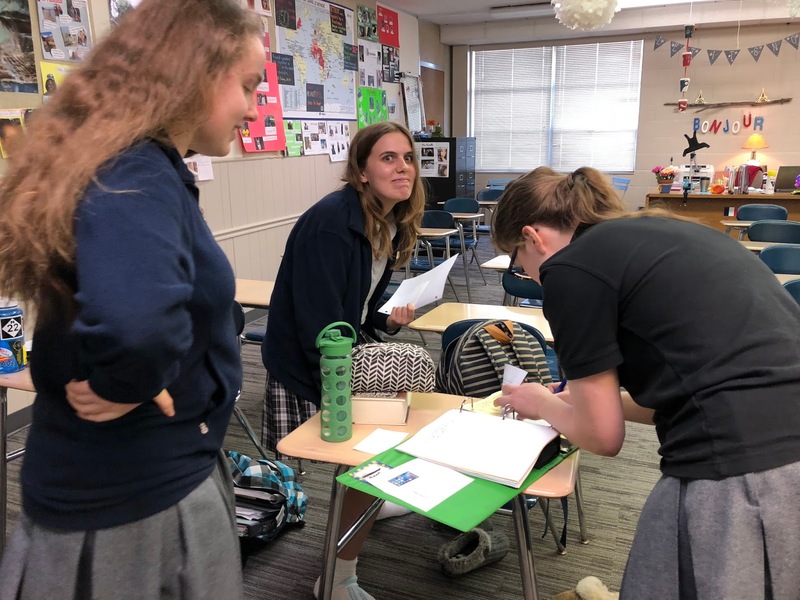 I've been teaching for a number of years, but for some reason I've never included Le Poisson d'avril (the French equivalent of April Fool's) activities in my classes. I tried it for the first time this week, and was happy with how it went. I explained the French tradition of taping paper fish on the backs of others without their knowledge and then yelling "Poisson d'avril" when the prank has been discovered. 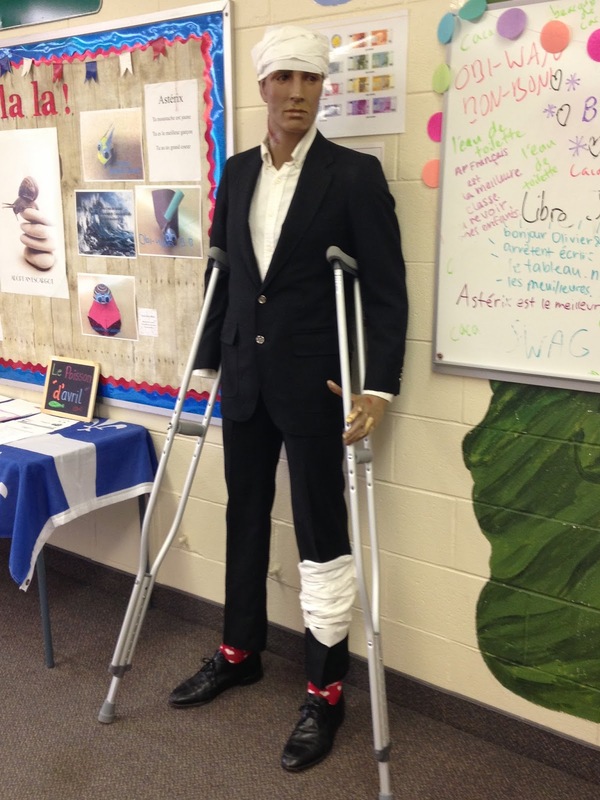 My classroom mannequin, Jacques, was decked out with fish in order to draw attention to the activity. 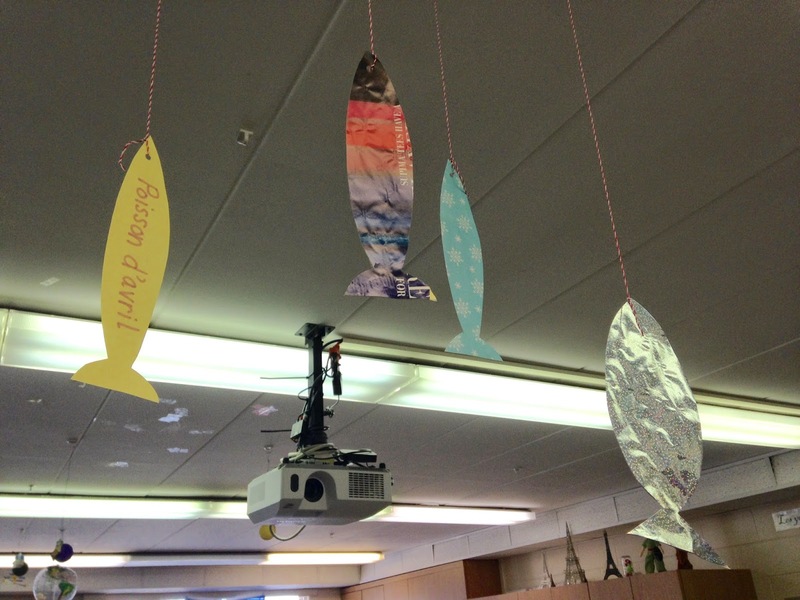 The paper fish are traditionally taped on one's back, but I put them on the front here so that students could see them. Student or sibling: 10 pts. To verify, students were asked to take a photo of the fish on the person's back and then email it to me. I was really wondering how this would all go, since I can think of a million ways it could have been disastrous. I'm happy to report that my students really had a ball, and it was just good, clean fun! Here are some of the photos they sent me. I love the look on her face...she has no idea yet that she has a fish on her back :). More classroom decorations. I found these on Pinterest. Aren't they cute? This is our high school counselor...she doesn't know she has a fish on her back yet :). The students seemed to especially enjoy trying to tag their teachers. This is a history teacher who loves to pull pranks. I can't believe anyone was able to get him! He was busy that day trying to scare students with a plastic spider dangling from a thread attached to a long stick....my colleagues are awesome! This is a music teacher. My colleagues were very good sports about it all! More fish for my classroom! I made these from scraps of wrapping paper and some card stock. Ha ha ha! Poisson d'avril! Happy Spring. P.S. No one was able to tag the French teacher! Huzzah!